Heavy Duty Storage Racks | Kendo, Inc. 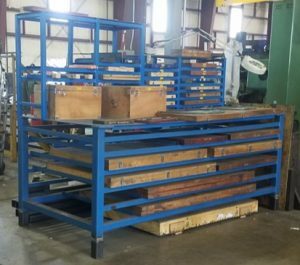 In the first application a local machine shop contracted Kendo to manufacture custom rack to organize and hold their collection of micrometers. The application shown above was engineered around putting the smaller gages on the top and larger gages on the bottom. These gages can measure from below an inch to up to 75 inches in OD or ID to 0.001’’ tolerance. By contracting Klendo to make the rack they can be rest assured that their micrometer gages will be safe for many years. 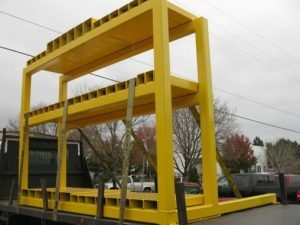 The next application show is the fabrication of a very heavy duty rack made for a customer who wants to store extremely large and heavy spare parts for giant mining machinery. The storage rack was designed with extended base to ensure it cannot tip over when loaded fully. For more information about these, or any other custom fabrication applications you need, or our other value added services please see the table below or contact us directly. Product Description: Heavy duty custom storage racks for mining and industry. Kendo can custom fabricate almost any application you need for your storage or Industrial application.